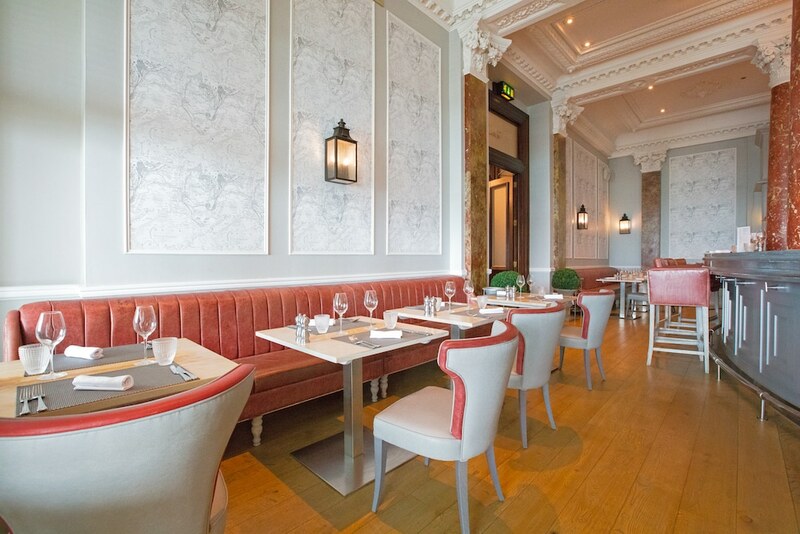 I discovered GB1 – The Grand hotel’s seafront restaurant – last year when I visited on a Thursday night. Impressed by the seafood-focused menu and relaxed ambience, I was delighted to be invited back for a Friday night, when the restaurant and adjacent bar have a real weekend buzz. The Victoria Bar serves excellent cocktails to kick-start the weekend, from classic martinis and sours, to signature specials like ‘Brighton Fizz’ and ‘Dark Passion Punch.’ And there’s a weekend program of live music, with jazz and contemporary tunes played on the grand piano – you can check who’s playing on the hotel’s website. 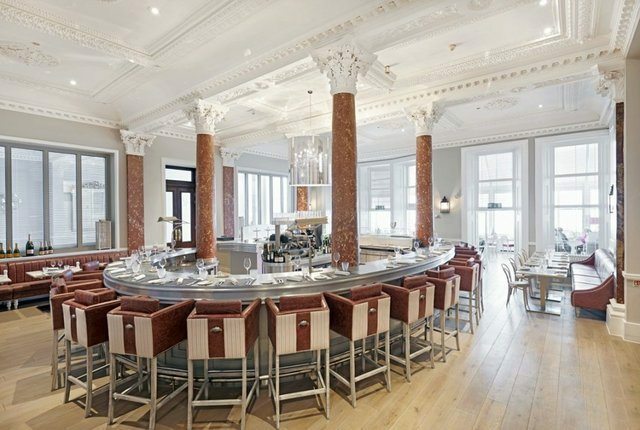 Across from the bar, GB1 specialises in seafood, serving everything from oysters and caviar to fresh fish landed in Hove, while the ‘grills’ section includes Southdown lamb, Sussex steak, local pork and more. Having arrived a few minutes before me, my sister-in-law Anna messaged to say she’d just ordered a drink in the bar. 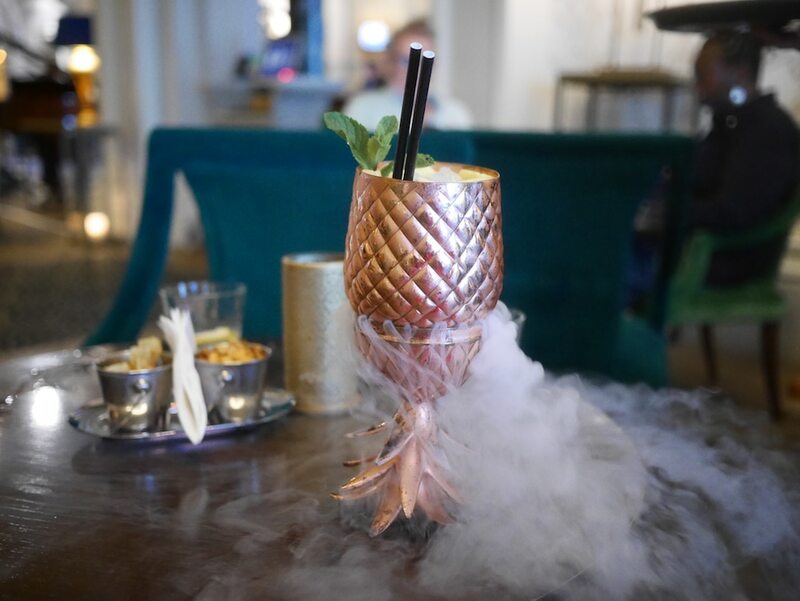 When I spied her across the busy room, she was sitting opposite a huge copper pineapple and was engulfed in plumes of dry ice. She’d ordered ‘The Colombus,’ one of the bar’s signature cocktails. Made with Diplomatico rum, peach puree, lime, vanilla and pineapple juice, it tastes as good as it looks: like a refined pina colada, minus the coconut and cream. I ordered one too and, as we sipped our pineapples and the room filled with music, chatter and laughter, I felt like we’d arrived somewhere truly special – the weekend had, most definitely, started. Taking our pineapples across the lobby to GB1, we were seated in the conservatory area, which has a smart yet informal feel, with views of the sea and the old pier. After deliberating whether or not to take advantage of the ‘Fizz Friday’ offer (half price selected fizz), we ordered a bottle of Vavasour Sauvignon Blanc instead, which was served in a standing ice-bucket and tasted crisp, refreshing and tropical. 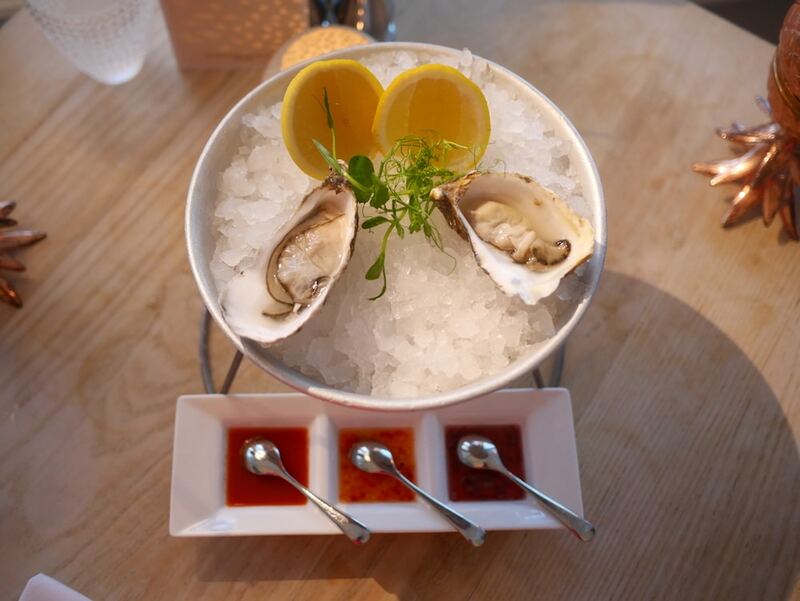 Oysters are a must at GB1, so we ordered a couple to start. Big, plump and salty-fresh, they arrived on a bed of ice with a wedge of lemon and three accompaniments: raspberry and shallot, chilli and ginger, and bloody Mary. Our very friendly waiter also brought over a basket of oven-warm sourdough. Recommended by the restaurant manager, I ordered the salmon to start. It was an excellent choice. 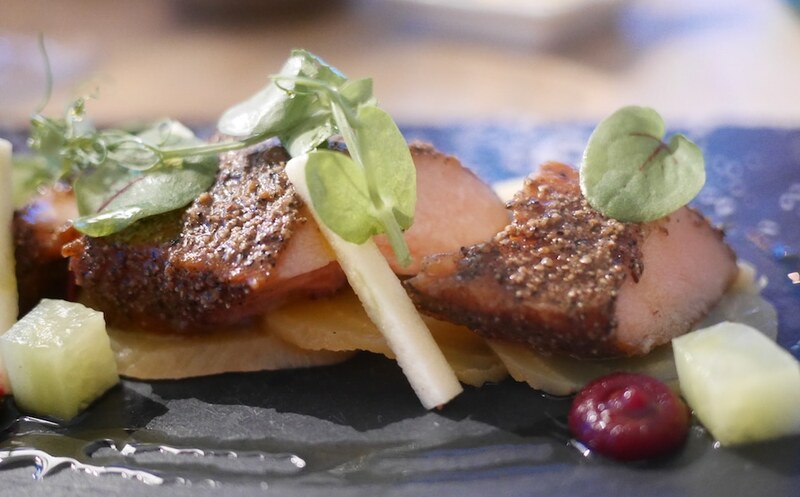 Hot smoked, my flaky pink fish had a spicy pastrami crust and was served with paper-thin slices of golden beetroot, red beetroot puree, and refreshing bites of cucumber and apple. 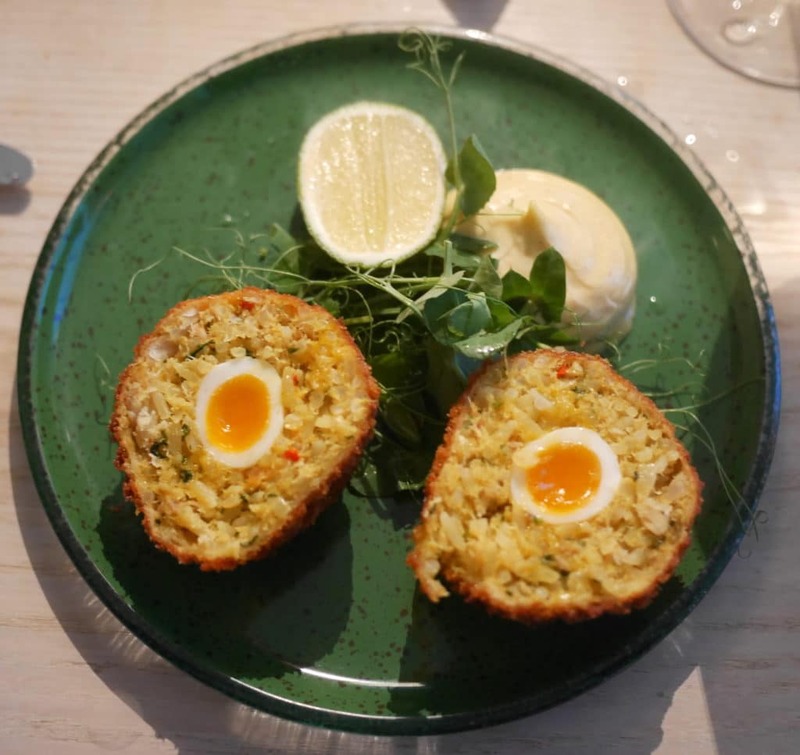 Anna went for GB1’s fishy twist on a scotch egg: poached quails egg encased in smoked haddock kedgeree. The yolks were beautifully gooey, and the smoky kedgeree was finished with crispy breadcrumbs. Served with fresh lime and curried mayonnaise, we both agreed that it would also make an excellent lunch or brunch. Sticking with the seafood theme, I ordered sea bass for my main. 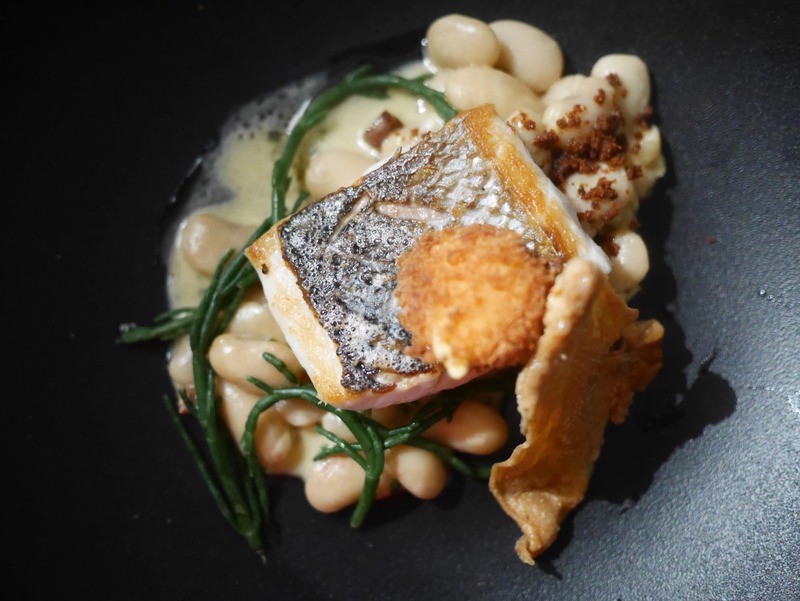 A ‘GB1 Favourite,’ my soft white fish sat on a bed of white beans and was scattered with suckling pig chorizo crumb. 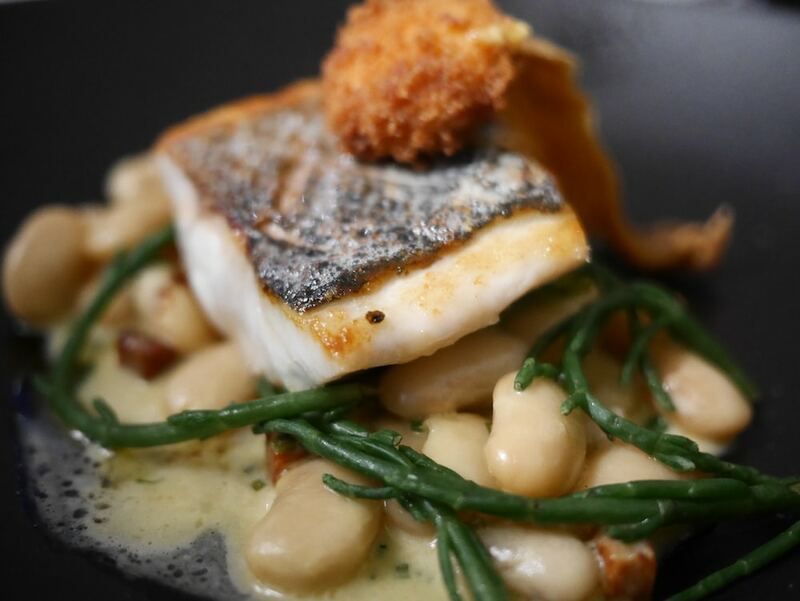 After savouring delicate mouthfuls of my fish (which went very well with our Sauvignon), I gave my tender beans a good crack of black pepper and scooped up the buttery velouté sauce. 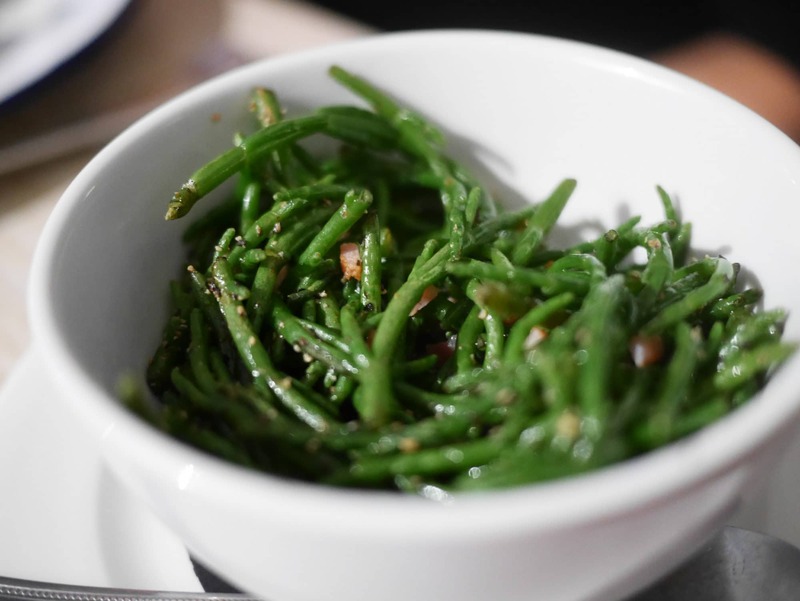 On the side, I tucked into glistening green samphire with flecks of salty bacon. Anna ordered the Wagyu beef burger from the ‘grill.’ Made with steak from Trenchmore Farm in Sussex, this is a cut above your average burger. Her two tender patties of rich, seasoned beef were topped with fresh tomato, rocket and melted Swiss cheese. 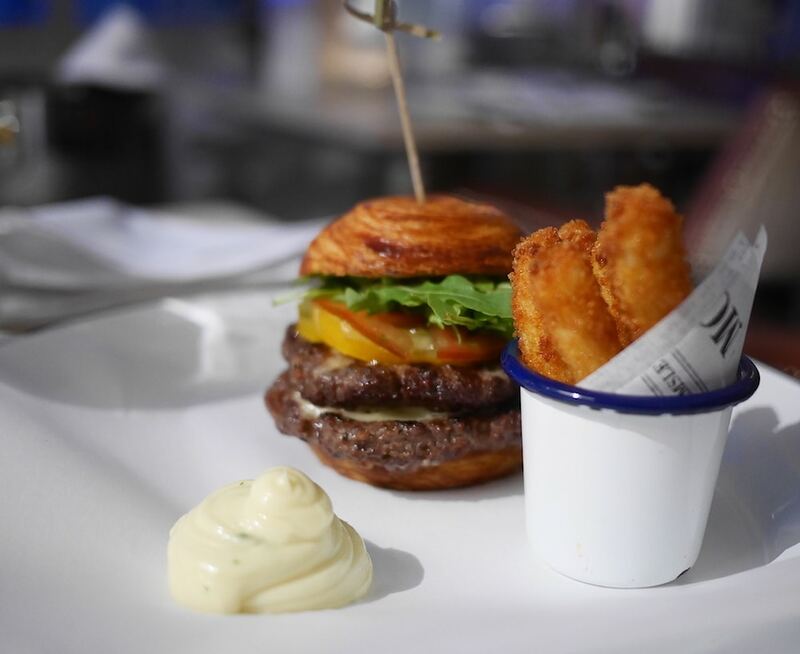 Her brioche-style bun was crisp, soft and buttery, and the halloumi chips with garlic mayo it came with were a big hit. She’d also ordered some fries on the side but, as tasty as they were, she didn’t manage to work her way through them all – big eaters will be pleased to know that portion sizes are on the generous side at GB1. 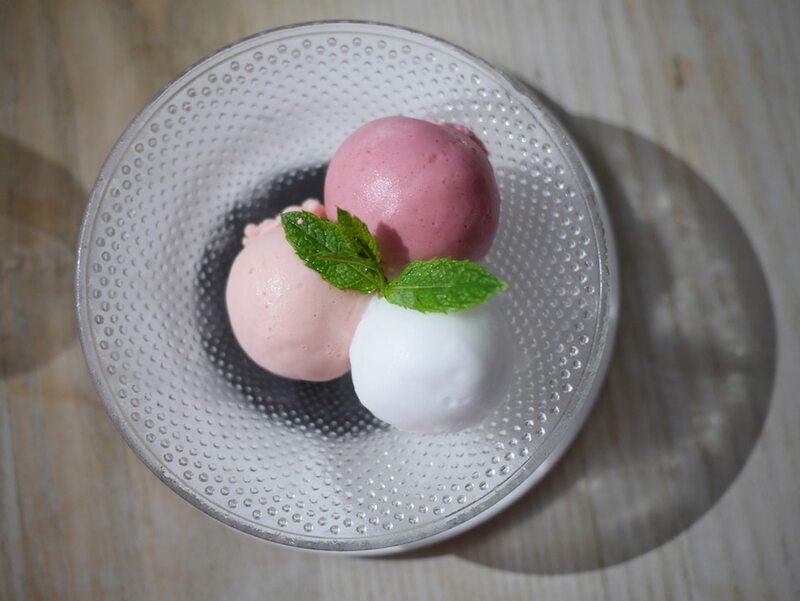 The dessert menu includes tempting dishes like Chocolate Fondant and Matcha Tea Panna Cotta, while cheese fans are in for a treat with an all-Sussex menu that includes High Weald’s award-winning Brighton Blue. Sadly, we were just too full to go the whole hog. Instead, we shared three scoops of ‘sherbet’ (like a smoother, creamier sorbet). Perfect if you’re feeling full but still fancy something sweet. The elderflower and watermelon flavours were particularly refreshing. To finish, I sipped a glass of golden yellow Concha y Toro Late Harvest Sauvignon dessert wine. From theatrical cocktails and live music, to Wagyu beef and oysters on ice, we felt like we’d be treated from the moment we’d stepped inside. 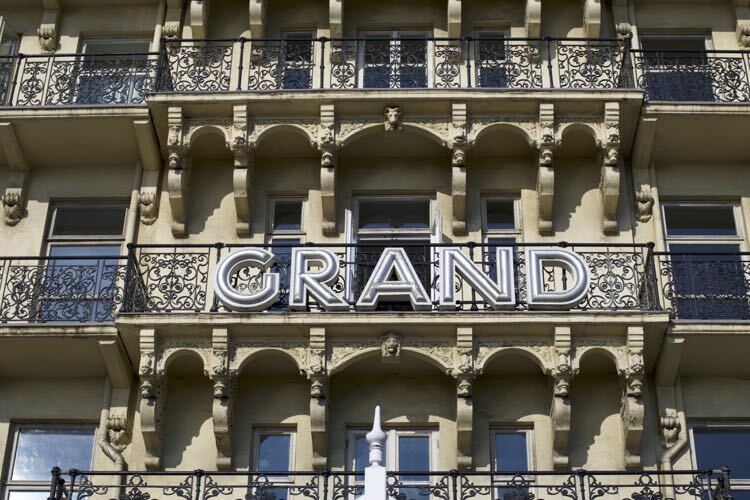 Weeknights at the Grand feel special but Friday and Saturday nights are a different kettle of fish.